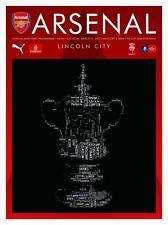 As many readers of Soccer History magazine are probably aware, I am a long standing supporter of Lincoln City, having first watched the team over 50 years ago. All fans know that there will be highs and lows when following a club, even if it’s Manchester United or Chelsea. It’s just that the further your club is from the Premier League elite, the more likely the lows will predominate. Soccer and the arts are fields that rarely combine successfully. On the literary side Arthur Conan Doyle and Albert Camus are often cited as examples of writers who had played soccer, but Conan Doyle’s links with football in Portsmouth were fleeting and Camus contracted tuberculosis as a teenager thus ending his sporting ambitions. The actor Sean Connery, who won an Academy Award in 1988 for Best Supporting Actor, played soccer but only in the Scottish Junior (semi-professional) game with Bonnyrigg Rose in the early 1950s when he was known as Tom Connery. Lincoln City’s unprecedented success in reaching the FA Cup quarter-finals as a non-league team this season has prompted this article on the club’s managers over time. I will consider the careers of three most successful managers in the club’s history: David Calderhead, Bill Anderson and Graham Taylor, followed by a brief resume of the current management team of Danny and Nicky Cowley and where they might fit into this history. Two other managers, Colin Murphy and Keith Alexander, deserve an honourable mention on this context, although neither quite achieved the heights reached by Calderhead, Anderson and Taylor.